Ocean Cove Jupiter are Divosta style 1,288 sq. ft two story townhomes with fenced courtyards. They have only 44 units in the complex and sit back off US 1. Ocean Cove has a community pool in the back of the complex and a small walkway out to Carlin Park. Carlin Park has the fitness trail, tennis and amphitheater. They allow dogs to 25lbs for owners. They allow 30 day rentals. You'll notice the extraordinary landscaping around the complex. Tucked off US 1 you'll never know it's there. Ocean Cove is a quaint beachside community that you will enjoy. Look at Ocean Cove when you have time. 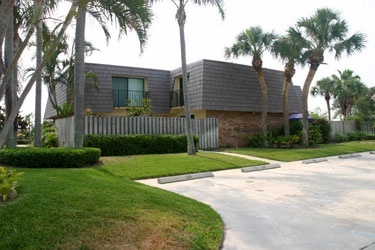 Browse listings for available Ocean Cove townhomes, or Read more about Ocean Cove community. With Carlin Park as your backyard in Ocean Cove you will find plenty of activities to keep you busy. With Carlin Park you will find mile and a half fitness trail running around the perimeter of the park and is a favorite for runners and fitness buffs alike. The track features a wood chipped padded running trail. They also offer lighted tennis courts for year-round play as well as two large fields that make a great place to play soccer, through Frisbees or just hang out. They also offer an amphitheater for live bands as well as the Shakespeare Festival. All this just in your backyard. Just across the street you'll find the lazy loggerhead Café a great place for morning breakfast or an enjoyable lunch. Behind the lazy loggerhead you will find the beach for a day of relaxation, some fishing or just their walk. All this at your back door in one of several Jupiter beach condos. Around Carlin Park you will find several other Jupiter beach communities including single family homes in Xanadu by the sea, Seabrook, villas on the green, Bella Vista and Jupiter Bay. Each of the beachside communities offer various different condo and townhome options to fit your needs. The little pocket around the park has always been a desirable area due to the close proximity to the beaches here in Jupiter as well as shopping, restaurants and outdoor activities. See more Jupiter real estate properties and Jupiter beach homes for sale here online. Call me to show you more Singer Island oceanfront condos or oceanfront condos on Hutchinson Island. We cover the coast when it comes to oceanfront properties. If a Ocean Cove Condo listing has caught your eye or you want more information about Jupiter real estate, please don't hesitate to call 1-561-744-7025, or email via our handy contact form with any questions or to arrange a showing.